Pieces of furniture in design exhibitions are usually treated as artifacts of strictly historical and formal interest. “Fin de Siècle,” an entertaining exhibition of 20th-century chairs, is wildly different. It turns chairs into characters in a florid theatrical production. Organized by the architect Andreas Angelidakis, the show presents an improbably eclectic, high-low assortment of 43 pieces. It includes Modern classics by Marcel Breuer and Pierre Jeanneret; fanciful postmodern works by Robert Venturi and Mario Botta; the monstrous Harkonnen chair, which H. R. Giger conceived for the movie“Dune” (it wasn’t used); and the “Gaiam Classic Balance Ball Chair,” which exercises people while they sit at their desks. The installation has an avant-garde nightclub’s ambience. 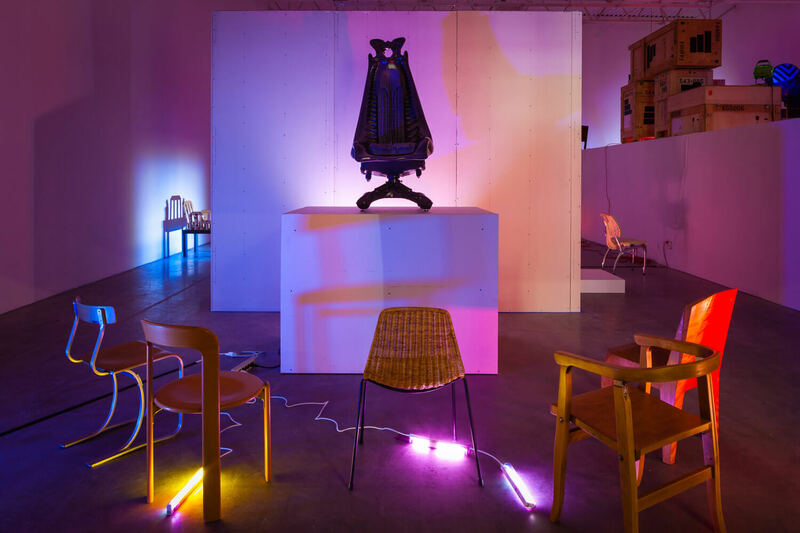 Displayed singly and in groups in the darkened gallery, the chairs are illuminated by blinking, revolving, strobing and glowing lights of many different colors. Some specimens have been placed on top of, or within, the wooden crates they were shipped in. Spooky electronic music fills the air. In this dramatic environment, the chairs seem to have personalities. Modernist pieces exude airs of aristocratic elegance. Elaborately decorative ones preen in once-trendy styles that now seem ridiculous. In the gallery’s basement, there’s a short, dreamy video by Mr. Angelidakis about a villa, now derelict, built by the impresario Alexander Iolas to house his art collection. As if all that were not enough, there’s this conceptual layer: The show is meant as a homage to Eugène Ionesco’s 1952 play, “The Chairs,” in which an elderly couple prepare a collection of empty chairs for a revelation about the meaning of life that never comes.